Here are 6 Important Reasons to have your Carpet and Upholstery cleaned regularly in Birmingham, AL. The most obvious reason is because they look dirty. But, there are several other important reasons to consider having your carpets and upholstery cleaned before they are visibly dirty. These other reasons have to do with the health of your family and the cost of your investment. 1. Regular cleanings remove bio-pollutants and improve the air quality in your home. 2. Regular cleanings remove dust and dander that can trigger allergies and asthma. 3. Regular cleanings remove microscopic bacteria and germs that can make you ill.
4. Regular cleanings help restore the color and texture of your carpet and upholstery fibers. 5. Regular cleanings prevent spots and stains from becoming permanently set into carpet and fabric. So, why not have your carpet and upholstery regularly cleaned in Birmingham AL by Heaven’s Best Carpet and Upholstery Cleaning? Your home will look and smell better, and it will help keep your family healthier. Heaven's Best Carpet Cleaning is a family owned, professional; full service Carpet, Upholstery & Floor Cleaning Company specializing in Low Moisture Carpet Cleaning serving Jefferson & Shelby Counties in Alabama. 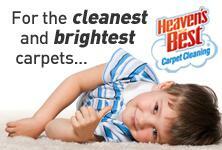 Heaven's Best offers professional, quality service at affordable prices. Our low moisture process dries in 1 hour and is safe for pets, children, and the environment. Call Heaven’s Best today at (205) 618-9150 to schedule your yearly cleaning.